3 miles on the schedule today.....done!!!! So it's taken me four marathons and over 30 races and I've finally received a marathon photo in a race from a professional photography worth buying. The reason I like it? 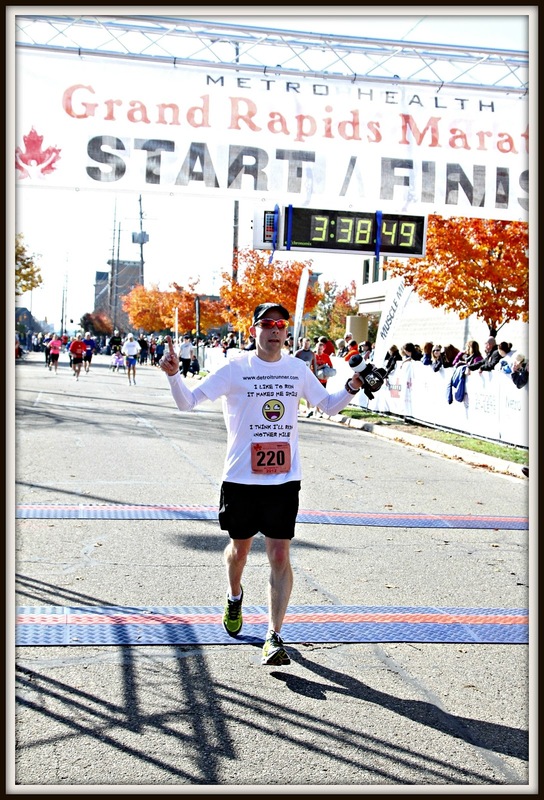 It's got the marathon name, my time(although chip time was lower), and just me in the picture at the finish. Probably a very rare picture so I decided to buck up and spend the $25 for freaking digital download of photo that I can print myself. Crazy expensive but I like it. What do you think? Do you buy photos from the race? That's a great finish line photo Jeff! I agree with you about them being expensive - I've only bought one set of race photos, and I had the same reaction. It was basically just a download, although I did get a CD too. And btw, congrats on the GREAT race time!!! I haven't been on many blogs lately and missed your report on this race, but you're getting fast man! That's an awesome picture with your PR on the clock - great job! That's crazy, I would never spend $25 for a photo of you!!!!! Nice photo. Don't think I've ever bought one - I realize it's expensive to be a photographer, but the prices seem high. I'd probably buy that one too. I never get anything that good, though. My norm is partially obscured, cut off on one side, or too far away to matter. If I had anything from Detroit as nice as yours, I'd probably fork over a little money. I've only purchased 3 photos. (will be purchasing 2 more; 1 from chicago and 1 from detroit 2011) One was me and my dad after my 1st half (detroit 2008), me and my dad after my first marathon (detroit 2009) and me and chris when I ran Rock CF this year since I was pregnant. I love this race photo of you. totally worth having, but dang $25 for a digital copy? What a rip off! Awesome picture!!!!! Well worth the money! I haven't bought one myself. But if they have a good pic of me crossing the finish line with me holding my daughter's hand in this last marathon, I will definitely buy one!!! That's really a GREAT picture! I've only bought one race photo ever and it was actually today. It is a picture from the sprint tri my girlfriend and I did in August. We are in the picture together and both look great. I can't wait to get it!